Now that you’re on your way to facing daylight savings time both nourished and refreshed, why not add a little style to your day? (Check out CG’s Daylight Savings Time Blues article if you haven’t already!) The college girl always finds herself a little busy now and then, and sometimes there just isn’t enough time to make a quick switcheroo in the wardrobe department. 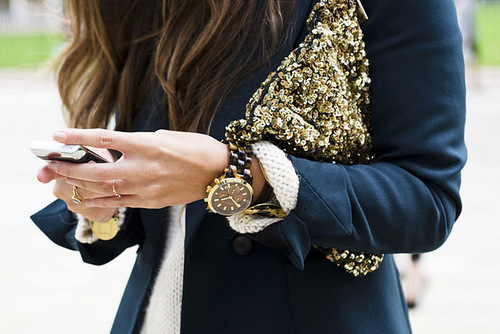 But why cut into your schedule when you can turn an outfit from casual to classy or simple to sleek on-the-go? No need to spend a little extra to look a little extra, because with the everyday wardrobe essentials you can turn any outfit from day to night. Belts, shoes, purses...oh, my! Every girl may not have the same exact accessories, but she’s likely to own the three essential wardrobe accessories, so why not put them to good use? Because these three items are the core pieces to making your outfit, make sure they correlate in one way or another. If you’re wearing a leather belt, you don’t necessarily have to have a leather purse or even shoes. Instead take cues from the buckle. If your buckle is gold, go for a purse with gold trim, zipper or even snap. Just make sure one piece doesn’t outshine the other. Are you more concerned with accessorizing your day wear? Modcloth has you covered with the adorable Illuminated by Morning Light Flats, Sold-out Show Satchel and quirky Worth Your Salt Necklace. Are you on your way from class to work, or even to a job interview? A well-cut yet simple blazer can snag you some brownie points in the fashion department as well as turn your school day outfit from drab to fab. Here is one look in two different styles. Black and white blazers are always a great investment as these two colors go with everything. Plus, they keep you from ending up in a fashion rut when it comes to matching colors and prints. When choosing a blazer go for a fitted silhouette, but not so fitted where as you feel suffocated when you button it. Because the blazer is your focal point in this piece no matter the color, tone it down when it comes to your shoes. Neutrals are okay, but avoid white heels, especially if you’re wearing a white blazer. Instead, go for something like these Topshop GABBI Metal Toecap Points offered in black and cream. The skirt pictured above is the Floral Jacquard Mini Skirt from Topshop. The tanktop, purses, necklaces and sandals are all available at modcloth.com. For an easy transition from day to night wear, there are five great fashion essentials to every college girl’s wardrobe: heels, a belt, a handbag, a little black dress and of course a neutral color blazer. With these five wardrobe essentials dressing up or even dressing down in a matter of seconds should be about the easiest thing you will ever do. And remember, you don’t always have to spend a little extra to look a little extra because you just might have some useful gems to really make your outfit sparkle!